Ankush Mandavia raises to 400,000 from under the gun and Thiago Macedo calls from the big blind. The flop is and Macedo checks to Mandavia, who continues for 350,000. Macedo folds. Thiago Macedo is first to act and he makes it 400,000. Action folds to Daniel Strelitz and he calls from the big blind. The flop falls and both players check. The pairs the board on fourth street. Strelitz bets 525,000 and Macedo calls. The hits the river and Strelitz moves all in. Macedo folds and Strelitz takes the pot. Thiago Macedo moves all in from the small blind and wins the pot before the flop. Christian Nilles moves all in from the button and Daniel Strelitz calls for 1,920,000 from the small blind. Thiago Macedo folds the big blind and the hands are turned over. The board falls , keeping Strelitz's ace-king high out in front to give him the pot. Ankush Mandavia raises all in from the button with the big stack, Chrisitan Nilles calls all in from the small blind for 2,345,000, and Daniel Strelitz folds his big blind. The board comes down , safe for Nilles to double up and take the chip lead. Daniel Strelitz raises all in from under the gun four about 1,500,000 and gets no action. Thiago Macedo raises all in from the small blind for about 2,200,000 and Ankush Mandavia folds his big blind. Daniel Strelitz raises all in from the small blind and Thiago Macedo folds from the big blind. Daniel Strelitz receives a walk in the big blind. The remaining four players are in the midst of a 30-minute dinner break. The blinds will be 100,000/200,000 with a 30,000 ante when play resumes at about 7:25 p.m.
Ankush Mandavia raises to 350,000 from the small blind, Christian Niles three-bet shoves from the big blind for about 2,300,000, and Mandavia folds. Christian Niles raises all in from under the gun for about 2,000,000 and gets no action. Action folds to Daniel Strelitz in the small blind. 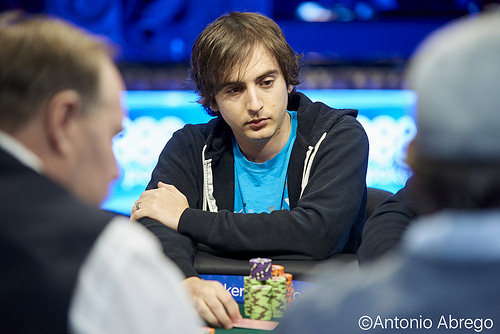 He moves all in and Thiago Macedo calls all-in for 1,220,000. The board falls and Macedo doubles with his flopped pair of fours. Ankush Mandavia raises to 325,000 from the button and wins the blinds and antes. Thiago Macedo moves all in for 550,000 from the button and Christian Nilles calls from the big blind. The board falls [7s, keeping Macedo's tens in the lead for the double-up. Daniel Strelitz shoves from the button and wins the blinds and antes. Christian Nilles raises to 375,000 from the button and Thiago Macedo calls from the big blind. The flop falls and both players check. The falls on fourth street and Macedo checks. Nilles bets 475,000 and Macedo lets it go. Ankush Mandavia makes it 325,000 from the button only to have Daniel Strelitz move all in from the big blind. Mandavia folds.